I recently helped CAFF (Community Alliance with Family Farmers) stage a Farm Invasion at Analy High School in Sebastopol to raise awareness about the importance of healthy local food in schools. Katina Connaughton, who farms with me for ZAZU and her husband Kyle generously donated their time to help me prepare roasted squash for the event. After an initial roasting, and adding butter, brown sugar and toasted pecans, Kyle used a torch to brulee the tops and create a caramelized crust. My sister Sarah and her boyfriend Ty grew the Delicata (which they donated to the event) at their farm in Sebastopol. Our table in the Analy Quad. When we got to Analy, I joined Heather, Susan and Danielle from the Sebastopol CAFF office, and Gayle Dyer, director of food service at all three West County high schools and we handed out samples of the roasted Delicata during school lunch. The roasted Delicata turned out to be a hit with staff and students alike. The kitchen manager liked the dish so much that she decided to put it on Analy’s menu for next week and I made my first delivery of Delicata to her the next day. On Tuesday, we staged similar Farm Invasions at Laguna and El Molino high schools. 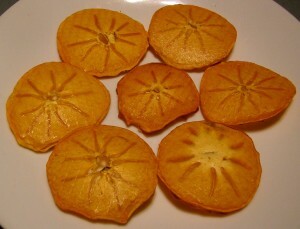 For these events we added sliced Fuyu persimmons from Rancho Pillow. Max and Katina thin beets in the new Zazu beds. 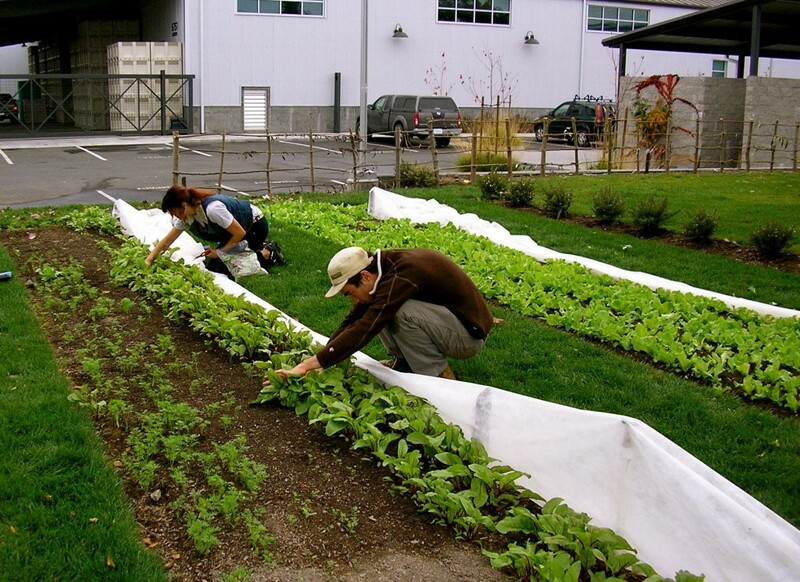 Behind them is Webb’s Wonderful lettuce, and Kosta Browne winery is in the background. 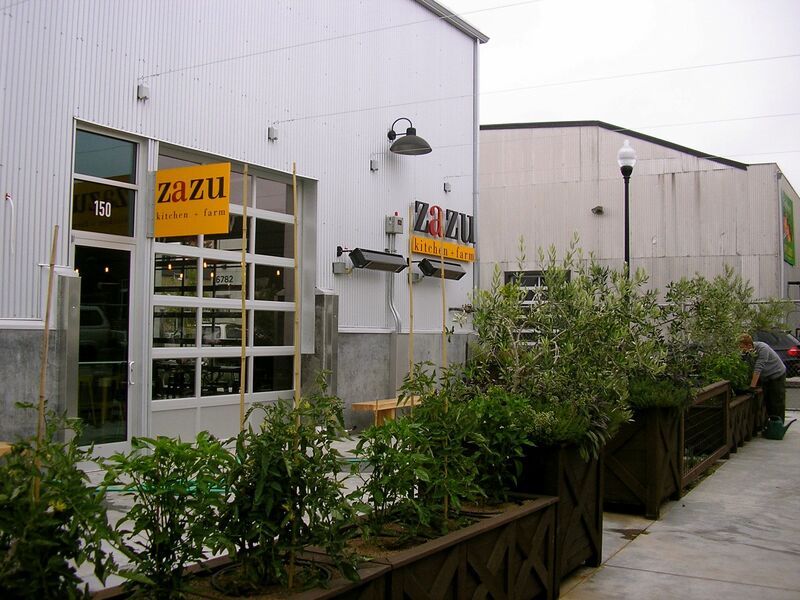 The Barlow decided to convert part of its events lawn across from the Skatepark into a produce garden for Zazu Restaurant, shown above. Katina and Max have helped me direct seed the beds with lettuce, beets, carrots, arugula, and radishes. We used an Earthway Seeder, which worked quite well. We’ve been thinning each week, and bringing the thinnings to the Zazu kitchen for use as microgreens. Its fun and nostalgic working so close to the skate park. When I was a kid, my skate buddies and I worked tirelessly organizing and raising money for a skatepark so we’d have a place to skate legally. We formed the West County Skate Park Association with community leaders like Jeff Weaver, who is now the chief of police, and Star Hergenrather, director of the Analy Drama Department. When my generation of skaters went off to school, my uncle Bill Cole and a few dedicated skate moms picked up the torch and after ten years, the skatepark was finally built. Before the skatepark was built, that area was an unofficial community garden, and I used to have a plot there during summers home from college. At that time, Taylor Maid was roasting coffee across the street in the old Barlow, where Spiritworks distillery is now. I have so many memories from the Barlow growing up; from climbing on the old stacks of apple boxes, to canoeing through it during a flood. It feels like I’ve already sprouted some roots in the ground we are working. The outdoor seating area at the new restaurant. Alex, the Foodish Boy is working in the background. 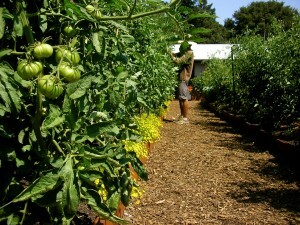 In the foreground are Padron peppers and heirloom tomatoes. Pictured above is the new dining room and bar. 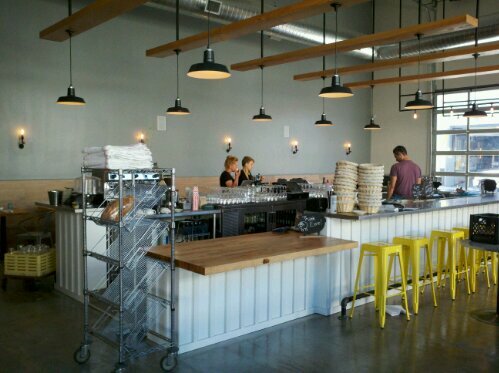 Zazu is now open for lunch and dinner wednesday through monday in the Barlow, a food and wine center in Sebastopol. The roadhouse on Guerneville Rd. is now closed. The new location will be open for lunch and will have a full bar! We also have a lot more space for food processing and preserving, so we’ll be able to produce a lot more pickles, syrups, jams, etc. Already, the new kitchen has made several batches of pickled Armenian, lemon and puna keena cucumbers. The kitchen will serve food late- till 11pm on fridays and saturdays, and there will be small dishes served at the bar from 3-5pm as well. Alex Nazaruk, a British food journalist, came and stayed with us as part of his mission to work 52 food related jobs around the world. Alex spent a day cooking at zazu and worked with me for a couple days on the farm. He blogged about his experience here. 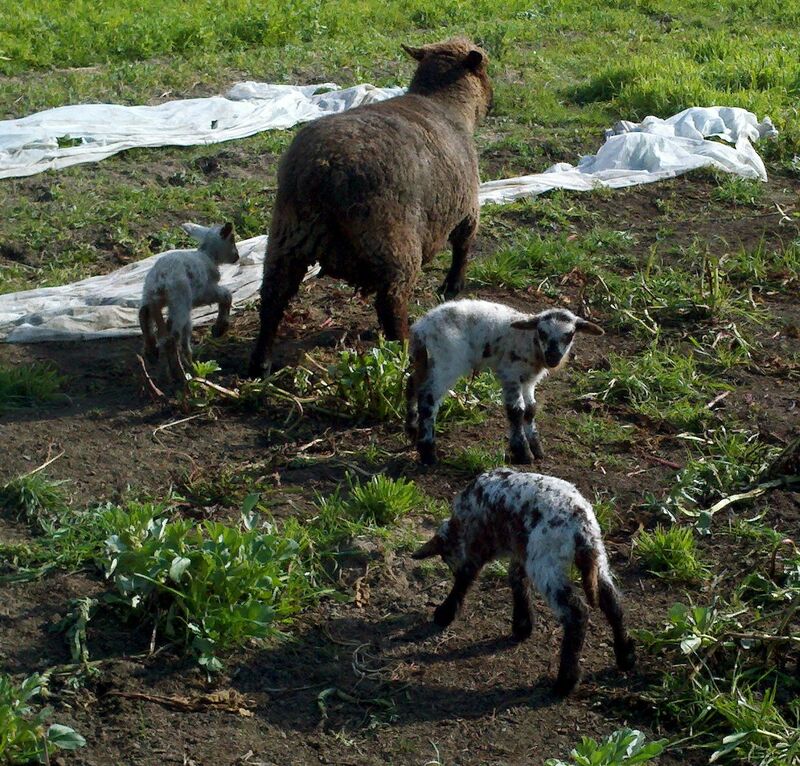 Day old triplets roaming around in the cover crop at Rancho Pillow. A week later, two black lambs were born. The plum trees and flowering quince are starting to bloom, coastal wildflowers are popping up, and lots of lambs have appeared. While the mushrooms have suffered, our recent spell of dry, warm weather is ushering in an early spring. I wrote a blog back in march of 2010 about some of the wildflowers you find this time of year in Sonoma County: Spring at Last. Caring for five lambs born in the span of two weeks has been a joy. The lambs are so cute and incredibly fast. Julian and I had to run as fast as we could to catch them for the vet. Even at one week old, they can leap high into the air. After so many long dark nights and slow to arrive dawns, these early signs of spring are most welcome, but I expect we still have plenty of cold and rainy weather to come. I’ve been busy making holiday gifts using what I have growing as much as possible. One of my favorites is pickled beets. To make them you start by roasting the beets. You could just coat them in olive oil and roast them in a foil packet, but I like to add some orange juice, bay leaves, and fresh herbs like rosemary and thyme as well. Next you peel the beets in cold water and slice them thinly and place them in small jars with spices like fennel seeds, coriander seeds and peppercorns. Then boil apple cider vinegar mixed 1:1 with water and pour this over the beets. Seal the jars and place them in a boiling water bath for 10 minutes, then put them on a dish towel and do not touch them for 24hrs. You can use this recipe to pickle lots of other stuff from the garden too, like baby carrots and chard stems. Dried persimmons are not just delicious, they are beautiful. 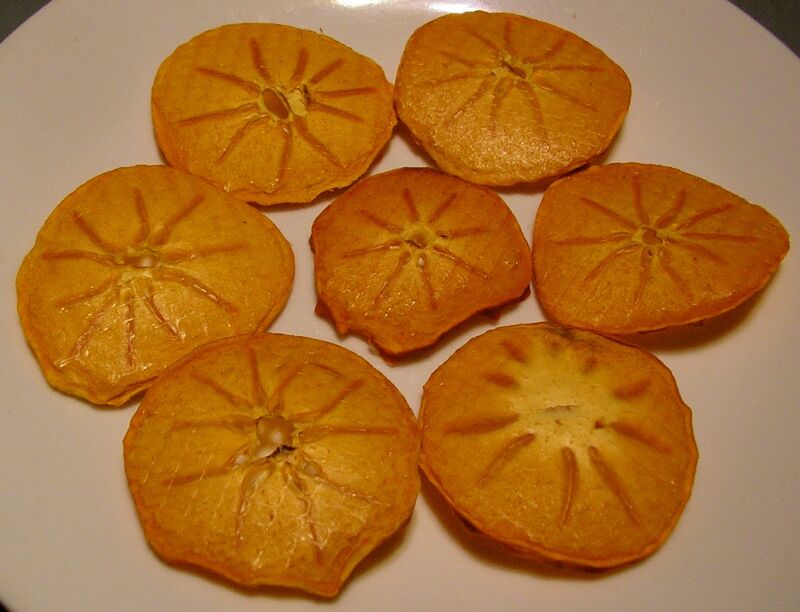 Another great gift to make is dried Hachiya persimmons. These trees are abundant in Sonoma County and most people don’t know how to eat them. Unlike the squat and crisp Fuyu, the acorn shaped Hachiya are ripe when soft and mushy, and otherwise are very astringent. It turns out that when you dehydrate them, they lose their astringency. So you can slice the Hachiya when they are orange and hard, around a 1/4in thick, and then dry them in a dehydrator or in the oven. They are addictive! 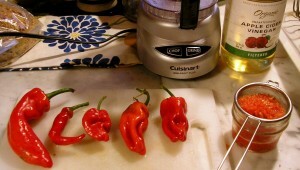 Lastly, I’ve been making hot sauce with a variety of different chiles. For a basic spicy vinegar I de-stem and roughly chop the peppers, then simmer them in vinegar, salt and water for about 10 minutes. Let this cool on the stove then strain it into jars or bottles. I like to buy the Tapatio bottles for 89 cents each and use them. For hot sauce, I puree the peppers first, then add them to the vinegar. I also add add Xanthan Gum as an emulsifier plus garlic and salt. I use different types of vinegar depending on how spicy the peppers are and what sort of flavor I’m after. For milder peppers, I use apple cider vinegar. For Thai chiles, I use rice vinegar. If you are making large batches of spicy sauce you may want to blend rice vinegar with distilled grain vinegar to save money. Padron and cayenne peppers for hot sauce. I also use jalapenos and a small fiery chili called Apache. 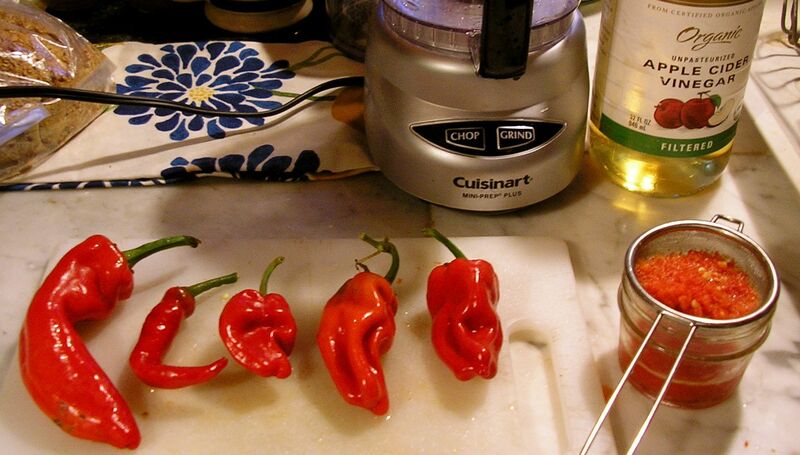 I use a mini Cuisinart to puree the peppers, before straining them into jars or bottles. 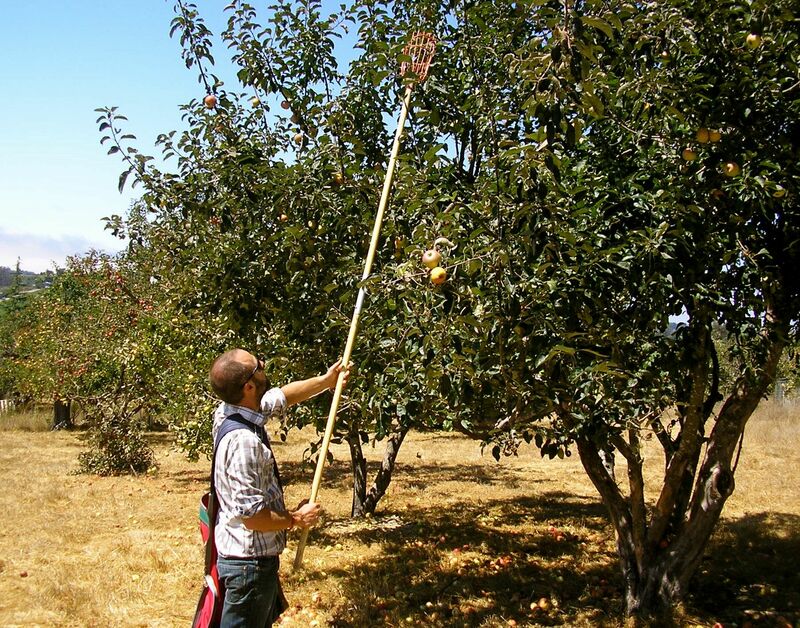 Over the fast few weeks we’ve been harvesting, pressing and processessing Gravensteins, the sweet and tart apple that made Sebastopol famous. I’ve teamed up with local cider brewer Isaac Alexander to develop several styles of Gravenstein hard cider. Together we have started the Sebastopol Apple Project (SAP), which is dedicated to preserving hertitage apples and apple culture. I’ve also been making lots of apple syrup, delicious on pancakes, ice cream, or in cocktails and smoothies. Our favorite Gravenstein cocktail is the Gravito. 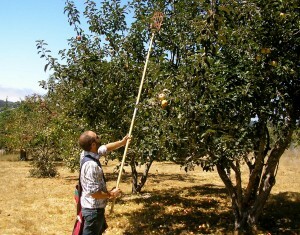 Isaac picking Gravensteins at Felton Acres. This tree had large, beautiful fruit despite no thinning. We realized it is just below where the chickens were processed for 2 years, so it got fertilizer and water every time the chicken processing area was sprayed down. The easiest way to make syrup is to fill a crock pot with fresh cider, then leave it uncovered on high till it is 1/7th of its original volume. Use a clean ruler to measure the depth of the juice. The syrup can be used instead of cider in cocktails like the gravito. We water bath can this syrup in small jars for use year round. 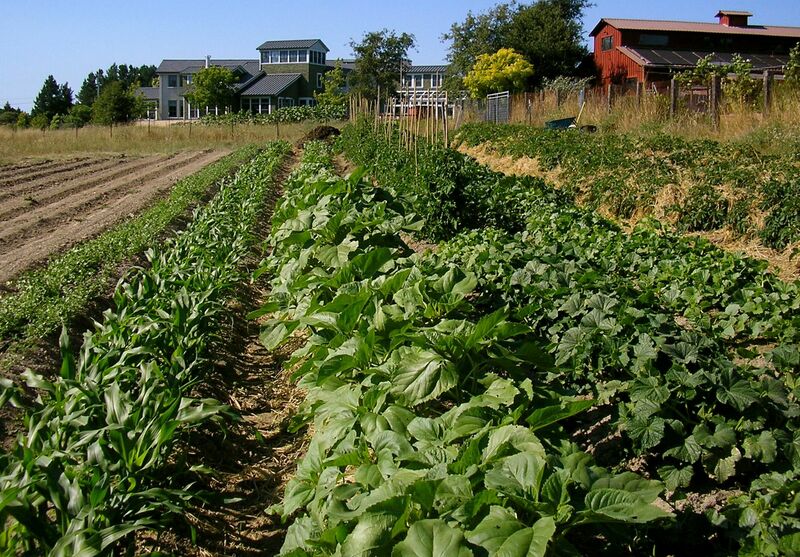 Zazu on the River is our new demonstration farm and lunch destination. 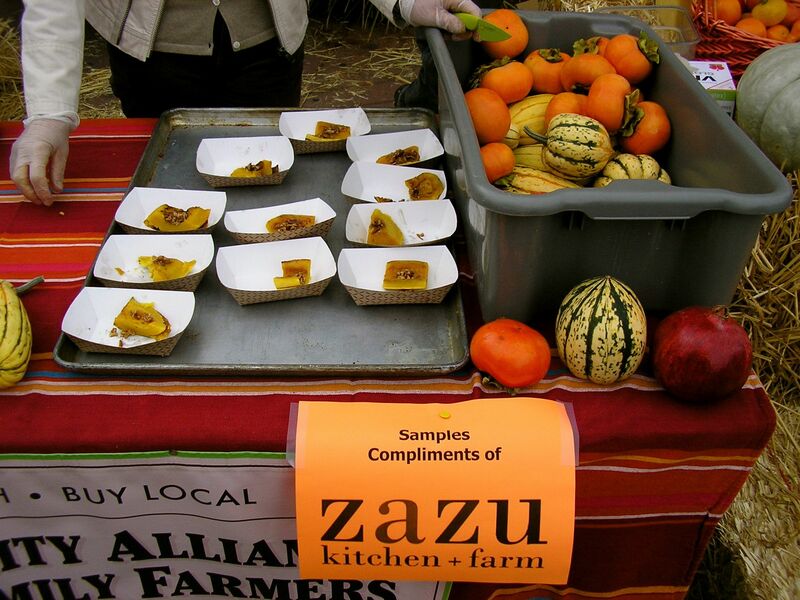 A partnership between Davis Family Vineyards and Zazu Restaurant and Farm. There is Bocce Ball, picnic tables, and a large shaded deck surrounded by our raised vegetable beds. Over by the Wine Goddess you’ll find troughs with tricolor amaranth and purple sweet potatoes. Look for these Armenian cucumbers on zazu’s salads and in gazpacho. Our Farm to Institution Committee hosted a Farm to School workshop at Santa Rosa City Schools last October. With over 70 food service staff and farmers in attendance the event was a huge success. 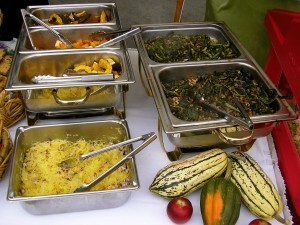 I harvested kale and winter squash especially for some of the demonstration recipes, which were served for lunch. After a series of talks by leaders in the farm to school movement we had a productive farmer/buyer speed dating session, during which connections and deals were made with school food service. Next week we are hosting a second workshop, where we will hold a series of breakout groups on topics like food safety and distribution. Our winter squash and new spicy kale being served to workshop participants. Notice that the winter squash is not peeled; when baked, the skin is soft enough to eat. Over in West County, I’ve been working closely with Analy’s eco action class. The class came out last Fall to harvest corn and plant fava beans on our farm(Three Leaf Farms). 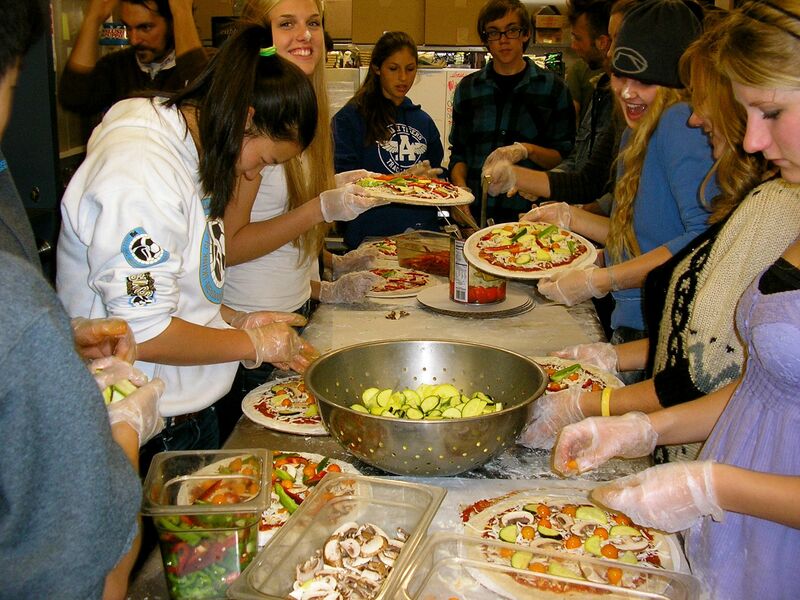 The students made pizza for school lunch last winter with Three Leaf Farms produce. Just last week, the students came and harvested the fava beans they planted and we made fava bean hummus. Since August I have been delivering between 60 and 200lbs of vegetables per week to Santa Rosa City Schools. These include kale, sweet peppers, radishes and squash. We now have written agreements to supply produce next school year. Analy students making pizza with Three Leaf Farms peppers, squash and tomatoes. Zazu baker Casey (on the left) gave dough forming lessons. Analy’s Eco Action class came out to work on the farm today. I was amazed by how much 30 high school studens could get done in an hour. The potatoes we harvested will be served mashed in the cafeteria next week. Analy students hoeing weeds at Three Leaf Farms. 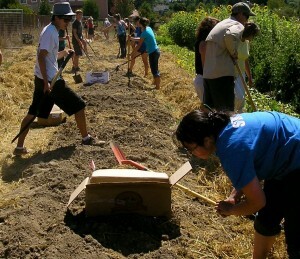 Students dug about 5 boxes of potatoes and hoed about 1/8th of an acre of weeds. 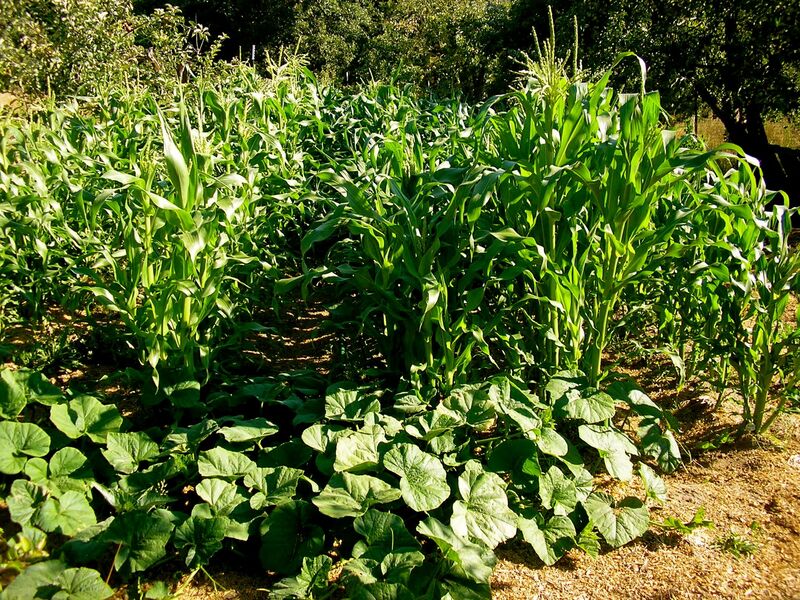 From left: garbanzo beans, corn, sunflowers, black eyed peas, cucumbers, tomatoes, squash and potatoes at Rancho Pillow. I just top dressed the corn and beans with fresh Silva Star Farm chicken manure. I’ve been experimenting with using fresh chicken manure on veggies, and the results have been remarkable. In the past I have only used composted manure, but I am now convinced that fresh manure is just as useful, if not more so. 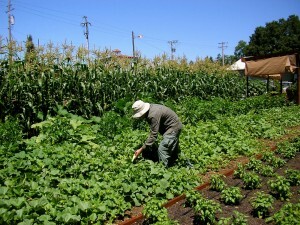 Providing enough nitrogen to veggies is difficult when farming organically. Fresh manure is full of available nitrogen, a nutrient which escapes quickly into the atmosphere when manure is exposed to light and air. This season I have limited my application of fresh manure to heavy feeding crops like corn, which is also a crop that has no direct contact with the soil (never spread fresh manure on salad greens). For the past 5 months we have had 300 chickens moving around Rancho Pillow in a 30ft eggstream trailer. Unfortunately, our proximity to Atascadero creek meant that predator attacks were frequent, despite electric fencing. We believe a family of foxes was digging under the fences and massacring up to 12 chickens at a time. Sarah Silva estimates she lost 80 chickens to predators since last March. It’s safe to say those are some well fed foxes! At Felton Acres, we have access to manure that is mixed with pine shavings in the 2 Brooder Rooms. Both were filled with about 2 and a half feet of manure, which we spread in the lower field around rows of corn and squash. Pine shavings and manure are both acidic, so I spread plenty of oyster shells to balance the PH. 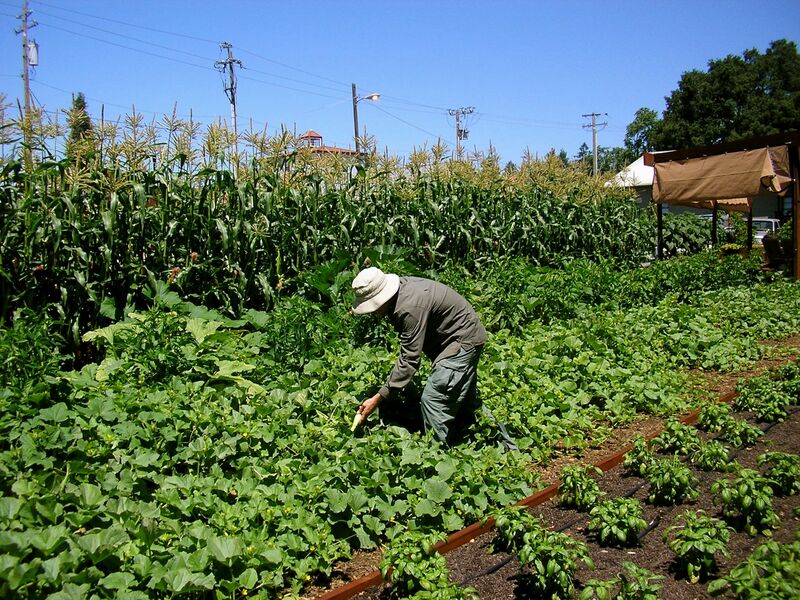 The corn an squash have been growing rapidly, and lots of tomatoes have volunteered from last year’s seeds. 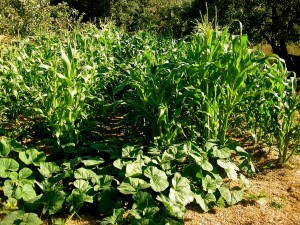 Corn and winter squash growing at Felton Acres in the pasture where we spread manure from the Brooder Rooms.